Depression is a scourge for millions of people - but it does not have to be this way. Hypnosis is particularly useful to target the underlying thought process and mental patterns that cause us to feel sad, depressed, lost or in grief. This CD or MP3 is proven to greatly assist turn these negative patterns around by replacing them with more positive thought processes, decisions and ultimately a happier outcome. 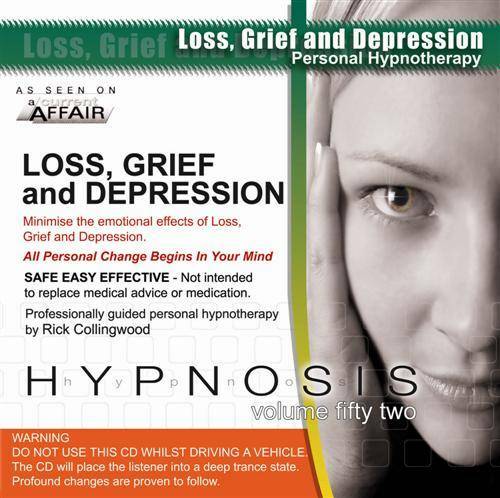 This self hypnosis CD or MP3 is suitable for all types of depression, however it is particularly useful if you have lost someone or something that was a major part of your life and you feel that your sadness is stemming from this. It will help you come to terms with the fact they are gone and also to assist in the grieving process and to let go. It will help you find other reasons and things in your life that will help you replace what you have lost in the best way that you can.